Despite its location on the Santa Monica Promenade in Los Angeles, Lotería Grill is a serious restaurant. The menu is limited, but always excellent, and it’s a pleasant, comfortable place to spend time with friends or just grab a quick lunch, as I did today. A creature of habit, I usually go for something involving their rich, spicy Morita salsa, but today was different. The holidays are traditionally the season for tamales, a dish that requires a lot of effort in addition to the love that always goes into them. How could I resist? 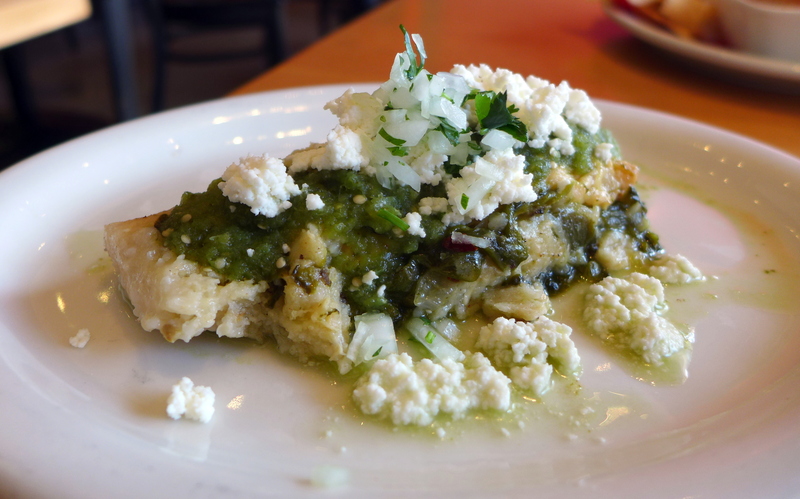 I had a choice, and went for the Tamal de “Rajas con Queso Panela y Salsa Verde.” One of my very few complaints about tamales is that they are often dry, but this was perfectly moist, without sacrificing the satisfying chewiness of the corn base. The rajas (nopal cactus) blended their okra-like flavor with the tomatillo sauce and poblano chiles perfectly, and it was quite possibly the best tamal I’ve ever eaten. This entry was posted in Food! and tagged Mexican Food, Nopal, rajas, Tamales by brucecritchley. Bookmark the permalink.